A stratus clood (St) is a clood belangin tae a cless chairacterised bi horizontal layerin wi a uniform base, as opponed tae convective cloods that are as taw or tawer nor wide (thir are termed cumulus cloods). 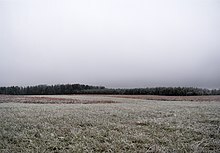 Mair specifically, the term stratus is uised tae describe flat, hazy, featurless cloods o law altitude varyin in colour frae dark gray tae nearly white. Stratus cloods mey produce a licht drizzle or snaw. A "cloody day" uisually featurs a sky filled wi stratus cloods obscurin the disk o the sun. Thir cloods are essentially abuin-groond fog fairmed aither throu the liftin o mornin fog or whan cauld air moves at law altitudes ower a region. Some cry thir cloods "Heich fog" for the fog lik clood. For instance, this clood in parteecular mey mean nae muckle activity, but rain micht faw. A stratus clood can fairm frae stratocumulus spreadin oot unner an inversion indicatin a continuation o prolanged cloody wather wi drizzle for several oors an then an improvement as it breaks intae stratocumulus. Stratus clouds can persist for days in anticyclone condeetions. It is common for a stratus tae fairm on a waik wairm front, rather than the uisual nimbostratus. If it is seen efter rain it shoud clear due tae wairm front succession, but if this daes nae occur the stratus must be pairt o the wairm sector o a frontal seestem; hivy rain mey stairt again wi the arrival o a cauld front efter several oors o stratus. Ackerman, Steven A. an John A. Knox, Meteorology: Unnerstandin the Atmosphere. Brooks Cole, 2003. This climatology/meteorology-relatit airticle is a stub. Ye can help Wikipaedia bi expandin it.